Around 3,300 Swans fans are in the South East corner of the stadium. This area has the corner section and part of the East & South Stands lower tiers. Being a new stadium, the view of the pitch and leg room are good, you also get padded seats. Food available includes handmade pies, with a choice of steak & Harvey’s ale with mushrooms, chicken, ham and leek and vegetarian butternut squash with spicy tomato. Cheeseburgers, burgers and hot dogs are also sold. The concourse is huge and spacious. Harvey’s real ale, Fosters, white or red wine is served within the ground. Brighton has a huge number of hotels, with it being a popular destination from London for the weekend. Hotels include Holiday Inn, The Grand, Jurys, Hilton, as well as many independent hotels and B&B accommodation. Friday night brings Thank You for The Music – The Ultimate tribute to ABBA & the Bee Gees to Theatre Royal (BN1 1SD), tickets are £16.50-£28.50. Soul Legends are there the following night, tickets are £28.75. Brighton Tattoo Convention is at The Brighton Centre (BN1 2GR) over the Saturday and Sunday. Tickets are £27.90 for each day or £44.60 for both days. There’s a charity football match on the Friday night linked to the convention at Stanley Deason Leisure Centre (BN2 5PB). Entry is £4 or £2 for kids. Funds raised are for The Clock Tower Sanctuary, a drop-in service providing support to homeless young people in Brighton. Hove Museum (BN3 4AB) showcases Collector’s Choice: Star Wars – a display of vintage Star Wars toys and memorabilia from the 1970s and 1980s. It’s on 22th Jan – 26th June with free entry. There is not much near the stadium. The Swan Inn (BN1 9PD) in Falmer, a 15 minute walk away is home fans only. Outside Brighton main station there are a number of pubs. Evening Star (BN1 3PB) welcomes away fans and serves real Sussex ale and cider. After the game the bars at the ground stay open until 8pm. If you want to avoid the queues at the railway station, the Watford v Everton game is on TV. The Downs Hotel (BN2 6BB) in Woodingdean, is 2 miles away and has a bar. There’s free parking at the hotel and they do a shuttle run (two minibuses) every 15 minutes between 1.30pm and 2.30pm, cost is £4 return and £2 for children. There’s no parking for away fans at the ground, but pre-booked coaches and minibuses can park. There’s a big no parking zone around the stadium on match days. The Bridge Car Park (BN1 9PW) is £15 and part of the University complex and a 10 minute walk to the Amex. It’s not a quick getaway after the game. The Club encourages fans to use Park & Ride services at Mill Road (BN1 8ZF), Brighton Racecourse (BN2 9XZ) and Brighton University (BN2 4AT). Probably the easiest for away fans is Mill Road, just off the A23/A27 junction. However, this is the busiest, so if you have time on your hands go for one of the others. Park & Ride is open from 12:00 on Saturdays (last departure 14:30). The last buses return from the stadium 90 minutes after final whistle. Cost of Park & Ride is included in match ticket price; just show your ticket. Vehicles must be removed 2 hours after the game. Mill Road is a normal road closed for Park & Ride. Going in, you park parallel in the next slot and it is easy to drive in. Buses and cars leave the road at the other end so it’s one-way and simple. The road is divided into zones (A-E). The bus stops at all zones so you end up close enough to your car’. An alternative is to park at Lewes Railway Station Car Park (BN7 2UP) and take the train to Falmer. The cost of the car park is £6.35 for the day and has over 200 spaces. The train take 7 minutes and it’s free. 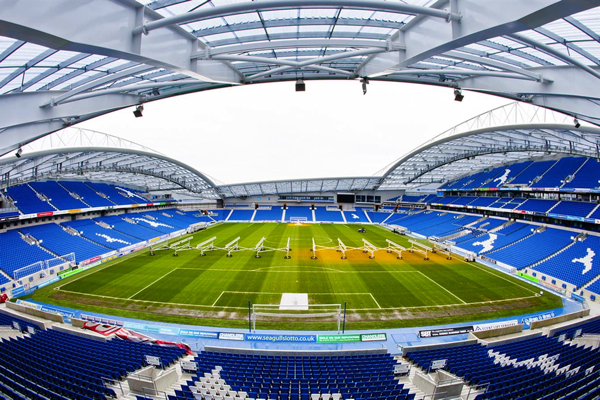 The nearest railway station is Falmer, which is right by the stadium; it’s three stops from Brighton central on the line to Lewes and Seaford. Alternatively, you can avoid Brighton completely by getting a train to Lewes and changing there for Falmer. There are four trains an hour in either direction. Brighton Central station is over 4 miles away from the stadium. Get a train, taxi or bus to the stadium. Brighton & Hove Bus No 25 is every 12 minutes from Cardinal Square stop G to the stadium from Central Brighton, same as Bus Numbers 28 & 29. Journey time is around 20 minutes. On return the No 25 leaves from the stadium via a stop through the coach park, near to the away fans gate. Trains leave Swansea for Falmer at 06:59, 07:29, 07:59 and 08:29 for the 5.5 hour journey. Trains back leave at 17:20 and 18:05 getting in at 22:44 and 00:03.